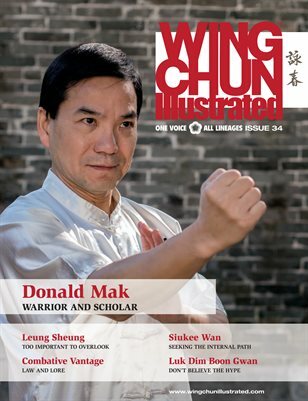 Issue 34 of WCI features Sifu Donald Mak on the cover. With almost 40 years of experience in Wing Chun, Sifu Mak is a practitioner and scholar, having researched Wing Chun’s history and theories and written a book, Willow in the Wind. While studying for over 20 years with Master Chow Tze Chuen, one of Ip Man’s direct students, Sifu Mak’s training emphasised, not only the conventional aspects of Wing Chun, but also kicking, footwork, and its soft approach, which he later crystallised into a standard curriculum, based on the teachings Master Chow learned from Ip Man and his own discoveries. For a complete table of contents, please visit our website.